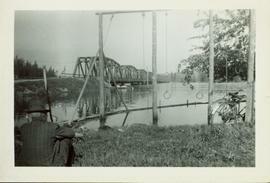 File consists of photographs of the Unveiling of the UNBC Entrance sign at donor recognition event . 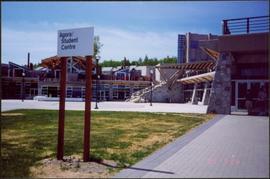 Videotape contains footage of the unveiling of a UNBC program on June 15, 1998. 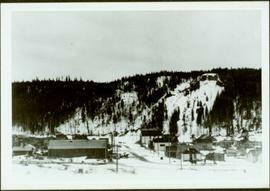 File consists of photographs of the Unveiling of the UNBC Entrance sign . 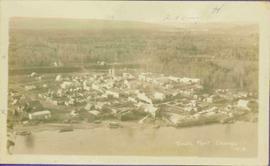 File consists of photographs of the Unveiling of the UNBC Entrance sign dedication event. 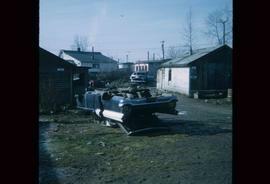 Image depicts a damaged, upturned car in Island Cache. 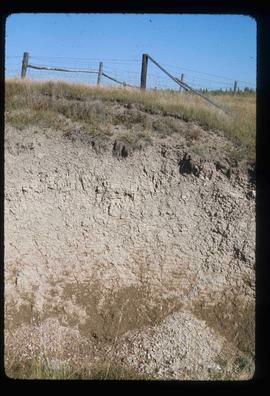 Image depicts an example of varves, an annual layer of sediment or rock, possibly located at the airport in Prince George, B.C. 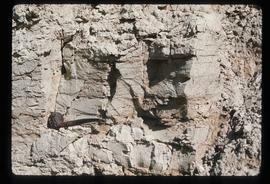 Image depicts an example of varves, an annual layer of sediment or rock, with a pipe used for reference size. 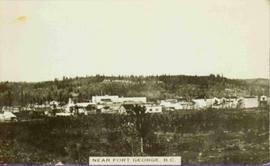 It is possibly located at the airport in Prince George, B.C. 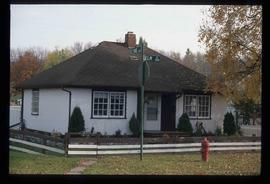 Image depicts a property given to the Veterans of the Second World War, located on the corner of 15th Avenue and Elm Street in Prince George, B.C. 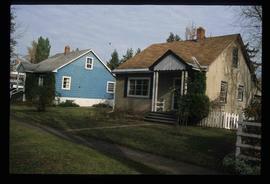 Image depicts some of the houses and land given to veterans after the Second World War, located on an uncertain street in the Milliar Addition suburb in Prince George, B.C. 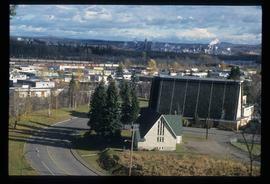 Image depicts a view of the Milliar Addition suburb from Connaught Hill in Prince George, B.C. 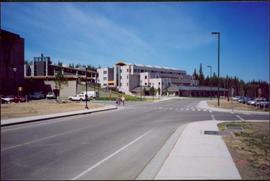 View of Geoffrey R. Weller Library from University Way, Prince George, B.C. 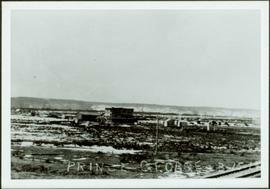 Photograph depicts First Nations burial grounds in foreground, Hudson Bay Company Buildings in background. 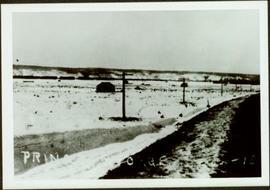 Winter scene with buildings, street, and utility poles. 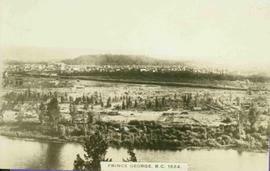 Hill in background.Handwritten annotation on verso: “South Ft. George 1912”. 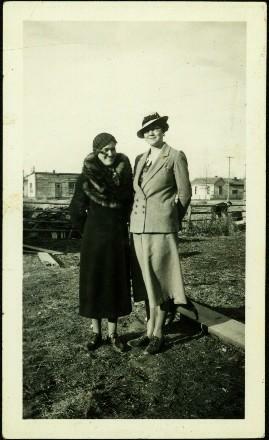 Violet (nee Taylor) Baxter and Ellen (nee Taylor) Garland stand wearing formal attire in dirt area. 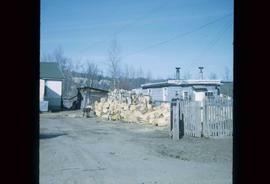 A lumber pile and unidentified man can be seen behind a fence that crosses the midground. 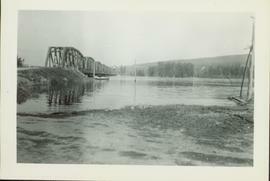 Power poles and other buildings in background. 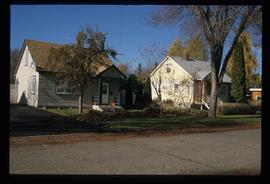 Videotape contains footage of: [May-08?] 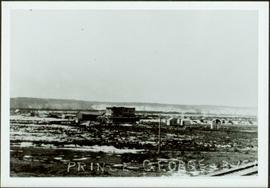 - Wilp Wilxo'oskwhl Nisga'a graduation ceremony; interview with Ben Spencer Sr.
Railroad track, utility poles, field, small building and background hills are visible in image. 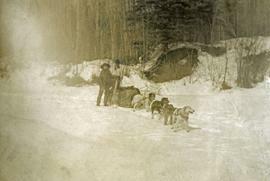 Photograph depicts a four-dog team harnessed to a loaded sleigh. 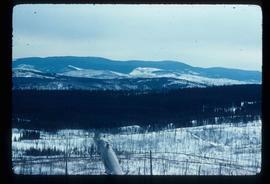 Two people stand near the loaded sleigh on a snowy forest path. 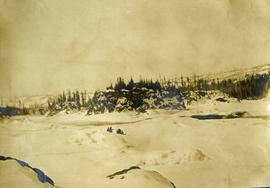 Photograph depicts two people and a dog team on a snowy river bank with a narrow passage of open water and a snowy bluff in the background. 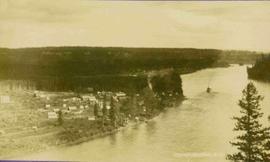 File consists of consent forms from participants who did not wish to continue with the Island Cache Recovery Project or who did not wish their material to be archived. 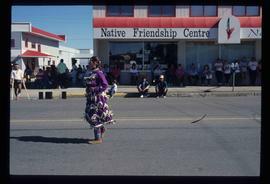 Image depicts a woman, wearing clothes reminiscent of traditional First Nations, who appears to be dancing in the street outside of a Native Friendship Centre in Prince George, B.C. A large crowd is looking on. 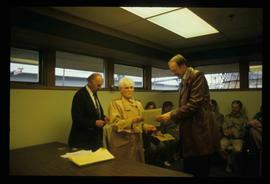 Image depicts a woman holding a sheet of paper in a room with numerous other unidentified individuals. 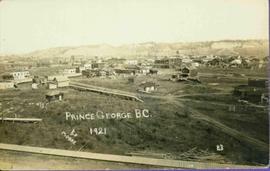 The man standing behind her is possibly Elmer Mercier, a former Mayor of Prince George, B.C. 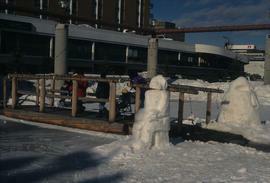 Image depicts two snow sculptures near a wooden bridge on an ice rink, possibly during the Winter City Conference, in Prince George, B.C. 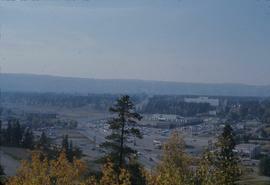 Image depicts what appears to be a shopping center or department store in Prince George, B.C. 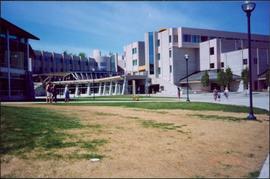 Videotape contains footage of the UNBC World's Worst Lecture contest with Joe Ackerman.